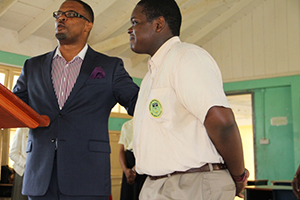 NIA CHARLESTOWN NEVIS (September 30, 2014) – Tourism Minister Hon. Mark Brantley on Friday September 26, 2014, showered praise on the Caribbean’s newest Junior Tourism Minister Rol-J Williams of the Gingerland Secondary School (GSS). The Minister went to the School to congratulate the 14-year old student, after he won the coveted title in St. Thomas on September 19, 2014. Williams participated in the Caribbean Tourism Association’s Youth Congress and won over participants from Anguilla, the Bahamas, British Virgin Islands, Dominica, Jamaica, Martinique, St. Lucia, St. Kitts, United States Virgin Islands and Turks and Caicos. “I want to underscore and emphasise that Rol-J would have beaten, I am told, 11 other competitors and it warmed my heart not just to hear that he won because I think the last thing I said to him before he left was ‘please try to make us proud and ensure that Nevis repeats.’ Last year we won and so this year we ought to have won and Rol-J, in his own style, said he would do his best. “Well his best was not only good enough it was better than expected …when I get calls from fellow ministers of tourism from around the region who asked me ‘where you all find this boy from? Where you all get this youngster called Rol-J?’ because apparently, he did not just beat his competitors but he beat them badly and so, it wasn’t even a contest and Rol-J I want to congratulate you. I have done so publicly via social media, I have done so in the media, I have done so privately but I want before your classmates and your teachers and your school to congratulate you. You have made me exceedingly proud and we are proud of you,” Brantley said. The Tourism Minister also congratulated Rol-J’s mother Mrs. Janice Williams, teachers at the GSS, Ministry of Tourism staff and others in the private sector who supported the students during the local and regional legs of the CTO contest. Mr. Brantley noted that tourism impacted everyone on Nevis and expressed that Rol-J’s win would serve as a reminder to his peers that they too were involved in tourism. “Tourism as I like to say, is everybody’s business and all of us are impacted by it. You might look around here and you say we might have had some repairs for the school over the summer, we might have had teachers teaching us, we might have had chalk and blackboards and whatever else we use, most of that, if not all of it, is assisted in terms of paying for it by tourism and so, when we talk about tourism, we have to understand that tourism generates the necessary revenues in our island. “It is still the dominant economic engine in our island and when we do well in tourism we have more moneys to provide education, to provide health care, roads and all the related services that we as a people, have become accustom to and so in many respects tourism impacts all of us and Rol-J is here, I believe, to demonstrate that as youngsters, you too can impact tourism and can be impacted by it in a positive way,” he said. “I would just like to say thanks to everyone who supported me in my journey,” a beaming Rol-J said to the audience. Meantime, Rol-J’s mother who had accompanied him to St. Thomas and was present at the School when Mr. Brantley visited, urged parents to spend time with their children as she continued to do with her son. She also gave some advice to the other students. “I first start by saying thanks to Almighty God and I always describe Rol-J as a blessing in disguise. It’s a long story I wouldn’t go there with you but anyway, my advice to parents – it is not always what you give to your children in terms of buying things for them, it is your time and many times I can recall I fall asleep in Rol-J’s bed. So you should know what I mean by that. “To the students, you cannot be Rol-J but you can do just as good as Rol-J. So thanks for all the support from the teachers and the students and other well-wishers. Thank you,” she said. 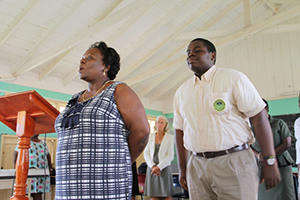 Nevis Tourism Authority officials hosts tourism partners in the U.K.